The items covered in this article will get your Bookstore ready for customers. You'll want to set these up after you've nailed down general Bookstore settings. Categories let you group your items into shopping pages. After you create them, they form the top-level navigation for your Bookstore. You can create up to seven main categories. Click add a new category. Click-and-drag to re-order the categories. Click to delete a category (items in that category will not be deleted). Now that you've created these categories, you'll see them in the navigation for Bookstore. Each category can have subcategories (e.g. Clothing > T-Shirts, Hoodies, Galoshes, etc.). Go to the category page and click edit subcategories; these work exactly like categories. When you create/edit items, you'll be able to add them to any of your categories. Shipping methods let you tack on additional charges for shipping orders. After you create them, your online customers will be able to choose one of them at checkout. Click Add a new shipping method. Give it a name. The name should also suffice as a brief description, e.g. UPS Ground (4-10 business days), Fedex Overnight, Pack Animal (4-6 weeks), etc. Enter the cost and whether it's Flat rate, Per Item, or Per Pound. Check if this shipping method is good for International orders. Enter numbers (1, 2, 3, etc.) to determine the order in which these methods will be presented to the customer at checkout. Click the radio button to set a method as the default (which will be the first option in the shipping drop-down). Pick up at bookstore is always an option for your customers. When you're done, click Save Shipping Methods. Now that you've added a shipping method, your customers can select it at checkout. If you need to retire a method, click . Discount codes let you offer various kinds of discounts—faculty and staff discounts, sales on particular items, promotions, free shipping, and so on. They're entered at either the point of sale or the online checkout screen, at which point the discount reduces the order's total price. The code itself is automatically-generated alphanumeric nonsense. Yay computers! Feel free to change it into something meaningful and more memorable, e.g. 56F977B587189 >>> SAVE15. Select whether this is an amount or percent discount, and then enter the number. For a $10 discount, you'd select amount and enter 10; for a 15% discount, you'd select percent and enter 15. Select whether this discount applies to All items, Selected items/categories, or Shipping. If it works for selected items, search for the categories/items to list them individually. Select whether anyone can use this code, or if it applies only to certain roles. If the latter, select the role(s) from the drop-down. If this discount only applies to orders above a certain amount, enter the minimum amount. If you enter 50, the discount will only work for orders of $50 or more. If the discount is only to be used a certain number of times, enter the maximum number of uses. If you enter 25, the discount can only be used 25 times before it expires. If you leave it blank, the discount has unlimited uses. If you give the discount an expiration date, that will trump the maximum number of uses. Can the discount be combined with other discounts? That is, can a customer get 10% off and free shipping? Check Yes or No; to be used together, both discounts have to be checked Yes. Can this discount be used for online orders or only at Point of Sale? Enter dates/times for when the discount is valid. 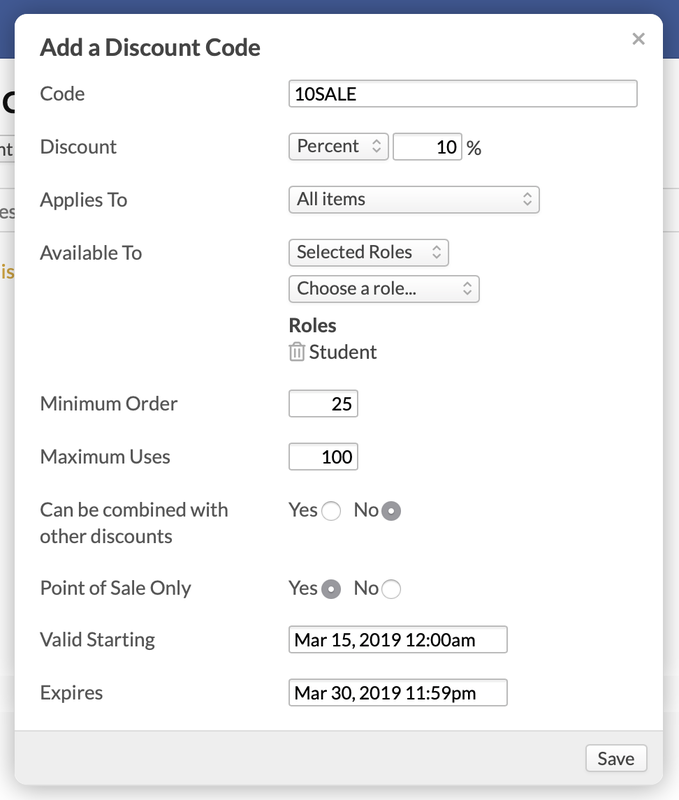 Leave the Expires field blank to make the discount valid in perpetuity. Expiration dates trump other limits like uses. Now that you've added this discount, you (and your customers) can start applying it to orders (as of the start date, that is). You can edit the discount details up until the first time it is applied to an order, after which time you can only add or change the expiration date. When someone returns an item, return reasons let you keep track of why the item was returned. Enter the reason, e.g. Defective, Wrong color, Aunt with bad taste ordered it for me, etc. Check to make this the default return reason. Or, don't! Once you've added this reason, you'll be able to include it when you process a return. You can edit or retire a reason by clicking the reason name. 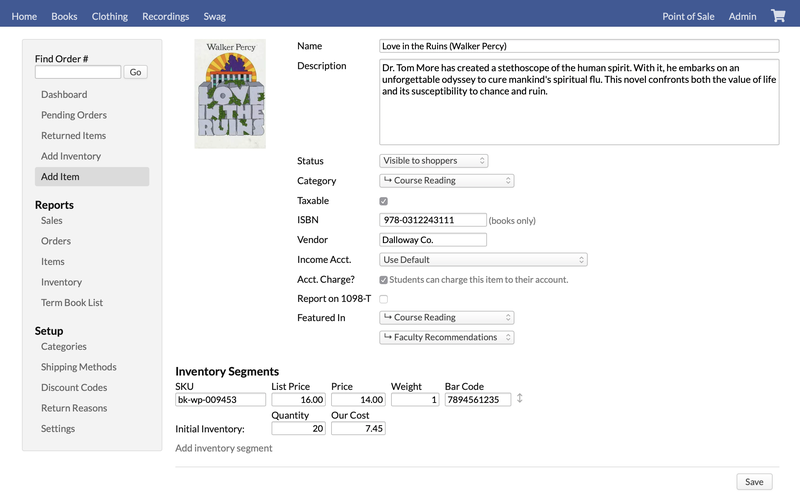 Read about how to add items (as well as how to add and manage inventory segments). "Purchase" the item online and at Point of Sale. Use a real credit card. Mark the order as fulfilled and "ship" it. Go through all the motions. Try out the return/refund process. Make sure the income flows to the correct places in your Chart of Accounts. Charge some items to a student account. Make sure they show up as pending charges on the student's account.